Are socio-demographic variables relevant factors of municipal waste generation? 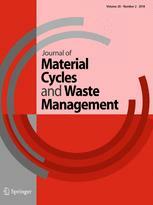 ABSTRACT: Increasing pressure of the European Union on diverting municipal waste from landfills requires an active role of households and commands a radical change of their behavior. Knowledge of behavioral patterns enables an effective design of municipal waste management systems. Based on several factors influencing environmental behavior, this paper aims at analyzing differences in municipal waste generation among Czech municipalities using socio-demographic factors. A set of 12 characteristics for 5445 Czech municipalities was investigated. Using ordinary least squares regression, we developed a model with eight indicators describing household size, gender, completed education level and diverse housing characteristics. Even though the model explains only 5.1% of waste generation variability among Czech municipalities, it is statistically significant. Other factors such as age or population density do not improve the model significantly. The resulting model will be used as a basis for further spatial analysis.